The day started off with a switch in bus drivers from Marcus to John Paul. It was sad to see Marcus go but it was a lot of fun listening to John Paul’s irreverent humor. John Ruth led our morning devotions on how Jesus responded to the Sadduces with mercy and not sacrifice, encouraging them to read and learn his ways. We than sang together from the Hymnal: A Worship Book sampler tucked behind each of our bus seats. Our first stop was the Remagen bridge (located in the Rhineland-Palatinate region of Germany) which played an integral part in the WWII fall of Hitler’s power. The last bridge to be destroyed was the Remagen bridge which breaches the Rhine River, the great moat that divided Europe. This bridge was eventually destroyed as well, but only after 10,000 American troops crossed over into Germany. Today the bridge and accompanying museum stand as a symbol for peace and reconciliation. We also stopped in Koblenz to see the “German Corner” called the Deutches Eck where the Moselle River joins the Rhine and pay homage to the father of Deutschland, Kaiser Wilhelm. Then we were on the road again, heading south, viewing the hill-strewn wineries of the Upper Rhine through the bus windows. We marveled at how they could maintain wineries on the steep foothills of the Rhine Valley, but appreciated seeing for ourselves where the German Riesling wine originates. When we stopped at Boppard for lunch, the St. Severus twin towers greeted us with their austere presence. Soon we were meandering the narrow streets of the Old Town, looking for brat sandwiches and cool, refreshing gelato. The curry bratwich was particularly tasty. We talked and ate in the warmth of the sun and realized despite some clouds, it was a perfect day for a riverboat cruise up the Rhine River. We boarded the riverboat, taking seats on the top deck and admiring the landscape as we pulled away from the dock. As the riverboat travelled against the current, we ooed and aahed with each new castle announced. The Hostile Brothers followed by the Burg Maus Castle were intriguing as we tried to imagine their occupants many centuries ago. Then the St. Goar Castle appeared before our eyes, very close to the Rhine and we were amazed at all that remained despite the ravages of the war. Even though we docked at St. Goarshausen, we knew it was not time to get off the riverboat because we did not see Wilmer or his familiar blue flag leaving the boat. After traversing the dangerous Loreley bend (the area that ship helmsmen find unnerving), we had to leave our enchanting castle cruise at Oberwesel. It had been an exhilarating ride on the Rhine once known as the backbone of Europe for commerce and trade. Our next stop was in the Palatinate region of Germany at the Mennonite Wierehof. We glimpsed the immaculate spread of farmland and learned that the Mennonites migrating to this area from Bern, Switzerland brought innovative and productive agricultural techniques. It was too late for cherry picking, but the soon-to-be-golden fields of wheat spread before us invitingly. When we reached the small Wierehof village, Astrid and Jochann greeted us with smiles and plenty of historical treasures. John Ruth grinned with delight as he fingered the 1556 Zurich Bible, the 1685 copper plates used in the Ephrata Cloister translation of the Martyr’s Mirror, and the 2000 sermons by the father of the Mennonite Encyclopedia and the first World Conference, the late Charles Neff. We took a walk through the village glimpsing the 3 spots of worship—the Adam Kraybill home, the small 1770 year building (that Napolean later used for his horses in the early 1800’s), and the 1830 meetinghouse where we decided to sing “Gott Ist Die Liebe” and 2 other songs. Soon it was time to go, but we appreciated Jochann Showalter’s tour and animated dialogue with John Ruth. After a walk around the graveyard of the Palatinate ancestors, we headed to our hotel in Alzey. 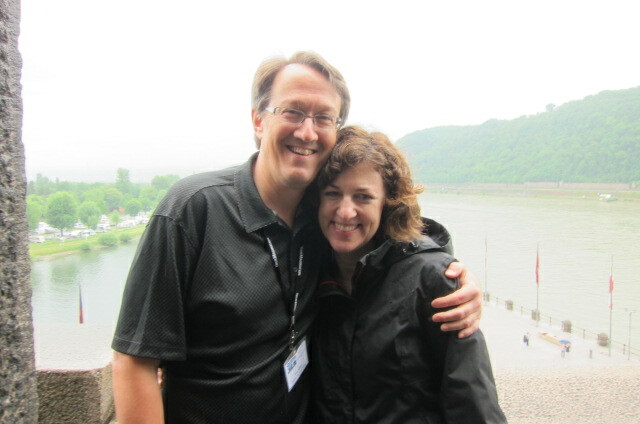 It was a good day of experiencing the Rhineland where our Mennonite ancestors lived, worked and strived to follow their conscience.